Get your breathing down to 6 breaths per minute. That's the range that triggers your body's baroreflex to calm you down and reduce the mental noise in your head. How can you do that? Use the following technique from the famous natural health specialist, Dr. Andrew Weil. This is a technique stemming from yoga traditions and shared by Dr. Andrew Weil, a leader in the holistic health and integrated medicine field for over three decades. For 4-7-8 breathing, breathe in through your nose for four seconds, hold your breath for seven, and exhale through your mouth (Dr. Weil suggests exhaling loudly) for eight. Repeat this four times, he says, and you’ll be relaxed enough to sleep. In the video below, he gives you a step-by-step guide for how to do this technique properly. While there’s limited scientific research on the method to either support or refute it, various, similar breathing techniques have been used for over two thousand years in yogic and meditative practices for either to relax or energize, depending on the method. More recently, a 2011 study in Health Science Journal identified potential health and relaxation benefits of deep breathing exercises, particularly from the diaphragm. One of the best things about this technique? 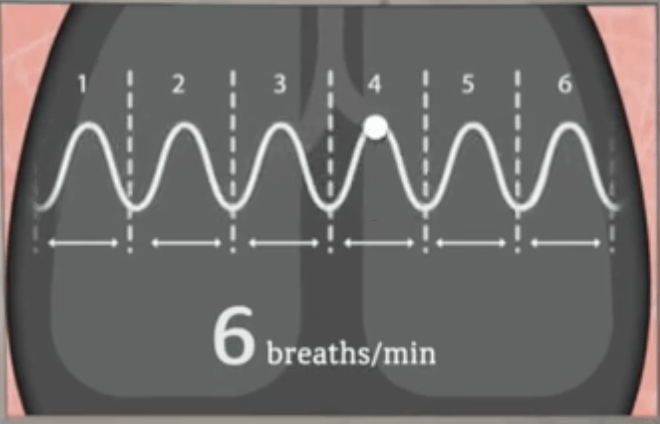 Unlike traditional insomnia medications or sleeping pills that face users with issues of increased tolerance, 4-7-8 breathing is said to get more effective over time, and when done for six weeks, can positively impact heart rate variability, an indicator for reduced stress, improved cognition, and decreased anxiety, according to this 2013 study on pranayamic breathing. The 4-7-8 method may be a boon for getting you some needed relaxation, if no shut eye, but insomnia can be an indicator of broader health issues. Is This Difficult for YOU? A lot of people find it difficult to do this type of breathing (or any meditative type of exercise) very hard to do for any length of time. If that's you, then there's a relatively cheap sleep tech device that helps you do this without much effort at all. Is the Inability to Sleep Rare for You, or Is It Becoming a Habit? How do you know when it’s gone from just a few sleepless nights to full-on insomnia? It turns out, the answer can sneak up on you. According to Dr. Susan Biali Haas, wellness expert and former insomniac herself who attended a talk on insomnia from Eric Zhou, Ph.D of Harvard’s Division of Sleep Medicine, insomnia is classified as when you’ve been “dissatisfied with the quality of your sleep for three or more nights a week, for more than three months.” Sound like you? In U.S. society, and most of the digitally-steeped world, stress plays a factor in our day-to-day lives. If left unchecked, stress can run away with your downtime. If you find yourself fretting about money, health, your family, or work, even in your alone time, brushing your teeth, or as you lay down for sleep, then stress could be playing a key role in your struggles with insomnia. Shift work is often an unavoidable evil. Bills have to get paid, mouths need to get fed, and often a night shift or rotating grocery store shifts can seem like the only way to make ends meet. Maybe you even enjoy the job you have, but the rotating shifts or late schedule could be a primary cause of your insomnia. Even if you work a more stable nine to five, business trips and long commutes can contribute to your erratic sleep schedule, keeping you from establishing a routine that signals to your body when it’s time to start getting to bed. Sometimes, it’s not an ever-changing schedule or work travel that disrupts your sleep, but your relationship to your evening routine itself. Often, we push back our time to get ready for bed until the last minute, eager to stay up and watch just one more episode, play one more card game, or have another glass of wine with your partner. However, if these activities push well into the night, leaving you flipping off the bedside lamp with the glow of a TV screen still running, you could very well be negatively impacting your sleep without realizing it. The blue light of screens interferes with your brain’s ability to tune into a restful energy. According to a study from Harvard, blue light suppresses the body’s ability to produce melatonin, the hormone that syncs us to our circadian rhythms – more on that later. Everybody gets peckish in the evening. And as commutes nationwide get longer, our dinner routines are getting pushed further and further back. Often, couples where both partners work a nine to five may find themselves sitting down to eat a home cooked meal closer to 7:00 or even 8:00 at night. Even if people eat dinner by 6:30, they may find themselves opening the fridge and snacking into the evening, eating popcorn while watching TV, or helping themselves to a large scoop of ice cream. When you eat too late, you can cause physical discomfort, digestive issues, and even heartburn, all of which keep your body from finding the restful sleep it needs. It seems like everyone in the U.S. is addicted to caffeine. When someone even utters “I don’t do caffeine,” heads turn to judge the person who’s somehow avoided our collective addiction. Because of this, it may seem like too much fo a change, or too stressful, to cut out caffeine altogether. But to get a good night’s rest, you should be cutting down your intake and setting a hard limit for caffeinated beverages. Be sure to double-check your drinks for caffeine past a certain limit – things like kombucha (and other probiotic beverages) contain caffeine that could be just enough to keep you from getting the sleep you need. If caffeine’s a habit you can’t seem to kick, be sure to quit drinking it by the afternoon, with at least six hours between your last cup of joe and your bedtime. Nicotine has persisted as a drug of choice worldwide for the same reason caffeine has: its efficacy as a stimulant. Dieters often turn to nicotine too, citing its appetite-suppressing qualities as a justification for the negative side effects it unleashes on users, one of those being insomnia. When a stimulant like nicotine is coursing through your body, it can be hard to fall asleep and stay asleep, especially as withdrawal symptoms kick in by morning and the urge for another cigarette disrupts the tail end of your sleep. Although the nightcap is a standard for some, it turns out, alcohol does not help you get a good night’s sleep. In 2013, a series of studies were reviewed on alcohol and sleeplessness. The conclusion? While alcohol helps you fall asleep immediately, it disrupts the quality of your REM sleep, which scientists believe is the most restorative cycle. Drinking before bed can keep your REM cycle from functioning optimally, leading you sluggish and forgetful the next morning. It is worth noting, however, that the study found minimal REM cycle disruption with a standard one to two drinks – so as long as your nightcap is truly just a single nightcap, alcohol is probably not the cause of your poor sleep quality. Alpha blockers are commonly prescribed to treat hypertension, as well as Raynaud’s Disease and benign prostatic hyperplasia. While they can increase blood flow and lower blood pressure, they are also known to inhibit the REM cycle, much like excessive alcohol, leaving you drowsy and forgetful the next day. Like alpha blockers, beta blockers are prescribed to treat hypertension, as well as migraines and glaucoma. However, rather than disrupting the REM cycle, beta blockers work by suppressing the body’s reaction to adrenaline, which can rear its head as you sleep with nightmares and waking up in the middle of the night. Used for diseases of inflammation like rheumatoid arthritis, gout, and lupus, corticosteroids contribute to sleeplessness (and to inflammation by proxy) by disrupting the body’s adrenal glands and igniting the fight-or-flight response. SSRIs have played a critical role in mitigating moderate to severe depression for many individuals suffering from the disease, and consequently can help reduce the stress and anxiety depression can cause. However, the fact is that scientists don’t entirely understand how and why SSRIs work, and consequently, they aren’t exactly sure why they can cause insomnia. According to one study in 2011, 81% of participants on SSRIs struggled with insomnia. Angiotensin-converting enzyme (ACE) inhibitors, like many of the drugs on this list, treat high blood pressure. With uncomfortable side effects like a hacking cough, headaches, and throat problems, trouble sleeping isn’t far behind. Used to treat memory loss in patients with dementia and Alzheimer’s Disease, cholinesterase inhibitors have several side effects that disrupt the quality of aging patients’ lives, including nausea, diarrhea, and insomnia. While these help slow the progression of Alzheimer’s Disease, they cannot stop or reverse it. A dietary supplement purported to improve joint health, glucosamine and chondroitin are a common addition to vitamin routines for people with joint problems and arthritis. Similar to SSRIs, scientists aren’t quite sure why glucosamine works, but they have determined that common side effects include insomnia and digestive issues. Prescribed to treat high cholesterol, statins have dangerous side effects with major implications. The muscle pain they cause has been described as debilitating and guilty of causing insomnia on their own. However, stanins further can penetrate the blood-brain barrier, causing chemical reactions that give patients night terrors and sleeplessness. If you aren’t on medication but struggle with mental health disorders such as anxiety and depression, you may have trouble falling asleep. Insomnia is a common indicator for depression, anxiety, and post-traumatic stress disorder. Sleep apnea causes disruptions in your sleep cycle by inhibiting your breathing. This can lead to a range of serious conditions, including chronic insomnia. Less deadly, but just as disruptive to your sleep cycle, are disorders like restless legs syndrome, which typically gets worse around bedtime. There are a wide variety of diseases that can cause insomnia, either by being a persistent irritatnt that makes relaxation difficult, or by inhibiting certain chemicals or hormones from helping you fall asleep. Common diseases that lead to insomnia include allergies, gastrointestinal problems, hyperthyroidism, arthritis, asthma, neurological conditions like Parkinson’s, chronic pain, endometriosis, cancer, and diabetes. If any of these lifestyle factors, medications, or diseases sound like you, then it may be time for you to determine whether it’s really insomnia you’re experiencing – and whether environmental triggers are the key. and how she felt the next day. By logging these things, Dr. Biali Haas was able to identify lifestyle factors that contributed to her insomnia, especially when she started getting ready for bed after eleven. This, she says, links back to our circadian rhythms. She says that regulating our schedules improves and balances our circadian rhythm, giving us better rest sooner. One thing she recommended was opening the curtains as soon as you wake up, to expose yourself to sunlight and regulate your schedule from the get-go. If you try a sleep log and still encounter sleeplessness, look at the other aspects of your sleep routine: limit alcohol to one or two drink servings, use blue-blocking glasses if you absolutely must look at screens at night, eat earlier – or stop snacking as late, and curb stimulating activity sooner rather than later. See our "Why Can't I Sleep?" article for the full list of potential sleep improvement tactics. Dr. Weil’s recommendation of the 4-7-8 breathing technique can also effectively help you relax, stowing away anxieties or worries to face head-on the next morning, supported by a good night’s sleep. Research has also suggested that you should leave the bed ten minutes after you start having trouble falling asleep or staying asleep; this is because the brain is wonderfully elastic, and begins to associate your bed with sleeplessness. Instead, go to the couch and listen to music, read a book, meditate, or do crossword puzzles. When you feel tired, try heading back to bed and getting some quality shuteye. Only after trying all of these lifestyle adjustments for several weeks with no results should you try supplements or medication. As was described above, many medications can have disastrous side effects, and insomnia medications are no different. When you use a sleeping pill, use them sparingly and only when you must. If you or your family have a history of addiction, opt for natural sleeping remedies like this tincture from Wishgarden, or any supplement containing chamomile, valerian root, skullcap, or St. John’s Wort. If none of these lifestyle adjustments or herbal remedies have provided you with relief, it may be time to consult your doctor about insomnia treatment. Don’t hesitate to find help. Bad sleep means more than a rough night. You deserve to feel energized and enthusiastic for each day. Insomnia doesn’t have to rule your life; start today by trying the sleep log. Let us know how it goes in the comments below! Nikita Andester is a Denver-based writer and graduate student of creative nonfiction. She lives full time in her camper, where she writes and whips up wholesome, plant-based meals. Her creative work can be found on Wild Musette and Loam Magazine.